The home is open plan, fully air conditioned with lounge, dining area. european kitchen, and three large en-suite King bedrooms. The Lounge has double patio doors leading to both the front and rear terraces, is beautifully and very comfortably furnished, & containes a large screen LCD TV with Satellite reception and DVD player. The dining area is adjacent to the kitchen and has a large table in the style of a breakfast bar with 6 matching dining chairs and patio doors leading to the rear terrace. The kitchen has ample cupboard, drawer and worktop space and is fitted with everything you would expect to find in a modern European kitchen and there are double patio doors leading to the rear terrace and pool deck. All the Bedrooms have large flat screen TV's and DVD players, private en-suite facilities and patio doors leading to either front or rear terraces. Outdoor space: The villa is set in a large plot with superb gardens and many tropical bushes and flowers. There is a large 10 x 3 m covered front terrace which is raised above the garden to provide excellent views of the large fish pond. This runs the width of the home and contains many water plants within and tropical plants surrounding it. On the terrace there is a Thai style marble type dining table with matching bench seating, 2 sofas, 2 chairs and drinks tables. To the side is a large car port and a garden planted with beautiful and various coloured Bourgainvillea.To the rear of the villa is another large covered terrace 6 x 4 m, with a dining table and 6 chairs, 2 large sofas and matching coffee table. This overlooks and leads to the pool, spa and sundeck area with 6 sun loungers.The whole house is surrounded with a 1.8 m wall and the boundaries have been planted with fragrant bushes and palm trees to provide privacy. The private salt water swimming pool is 10 x 4 m.
On site clubhouse with restaurant, gym, internet, large communal pool and spa, which you have full complimentary use of during your stay. cleaning service 1 afternoon per. week to clean & keep the villa sparkling for you. Gardeners to keep the plants and garden area in prime condition. Pool cleaning 3 times weekly. Free wireless internet access at the villa. A welcome food and beverage pack*. A meet and greet service at the villa. * See extras for surcharge & information. Tigger & Jitters are 2 cats that adopted us from being tiny kittens, after there respective mothers brought them to the Villa some 7 years ago, and whilst we are staying there we take care of them. Most of our guests, especially the children, love them being around, as they can be very entertaining, but also practical in keeping rodents etc. in check, however if any guests are allergic to cats or are just not cat people, then they are quite happy being outdoors during the course of your stay & if you don't wish to feed them, that's no problem, they are very resourceful. Cats are a big part of Thais lives, they adore them, and you will find them at most Villa resort places you stay. All Bathrooms have Rain & Soft showers. From the rear terrace there are mountain views to the west, where you can watch the sun set over them, and from the front terrace you will get uninterrupted east views towards the sea and enjoy the refreshing cooling breezes coming up from it. It is worth mentioning that all the top quality villas are between 6/12 km from town, we are about 6 km north of Hua Hin centre, which is easily & cheaply accessible by Taxi or Tuk-Tuk, but if you need maximum flexibility we would suggest Car or Motorbike hire as you will need some form of transport to go to the shops, town etc. We are in a 5* gated community resort, with on site club house, large communal pool & spa, gym, restaurant & wireless internet. Our villa is the top index rated property in Hua Hin on the Clickstay website, please take a look at the verified customer reviews. I stayed there for three weeks. The house was wonderful. The kitchen had everything. The private house pool was a good size, and the community pool was huge. The gym was adequate. I enjoyed the quietness. If you do stay here, you are going to need transportation - taxi, rental car, or rental scooter. The vacation was very relaxing. I had no issues with the stay. When I had a question, I would email John and he would respond promptly. He knew the locations of where to go for anything. He gave me a GREAT location to walk/exercise which was the viewpoint . I ate the local food, but there are plenty of places to eat European food. You are about a 10-15 minute drive from downtown Hua Hin depending on traffic. The two cats (Tigger and Jitters) at the house are wonderful pets. They are extremely friendly and they are not needy. I would recommend this place to a friend. Super clean, very comfortable beds and sofas. Excellent entertainment selection of TV/Music/Films provided. Fabulous pool with plenty of seating. Sweet cats! The resort is quiet and calm but only a 5 minute drive to the main road. Lovely green views of trees from the pool. Thanks for a lovely review, delighted you and your family enjoyed your stay, and hope we'll see you all again sometime. Beautifully presented villa, on a very well maintained peaceful estate. The owners are delightful and nothing is too much trouble. One of the A/C units stopped working in the sitting room and was replaced the following day. If you don’t hire a car/bike , the cost of a taxi into the centre of Hua Hin is THB 350, we also downloaded Grab, the Thai equivalent of Uber and a Grab Taxi cost THB 130 to the local Makro store. Several local restaurants will deliver meals to your door, which is great when you are out all day and just want to relax. Plenty of seating and dining areas outside the villa. Great TV and movie network. The two cats are delightful and absolutely no bother. I would definitely recommend this villa for couples and families. Thanks for an excellent and informative review, very much appreciated. It was our pleasure hosting you and hope we will see everyone again sometime in the future. The Villa is very well appointed and I doubt if you would need something that has not already been provided by the owners. My children enjoyed the stay so much that they asked if we can return on their next school break which I hope to do. They obviously really enjoyed the pool and jacuzzi. It is a short commute to the main road into Hua Hin town centre with access to all the attractions but there are also local restaurants if that is your preference. I would highly recommend this holiday villa. This villa is absolutely perfect for family and groups. Spacious, comfortable and fully furnished. 3 good sized en-suite bedrooms, a huge living area (compared to living in a HK ‘shoe box’), fully equipped kitchen and the most important.... saltwater pool with jacuzzi. Only 3 of us, one room each, super comfy bed we all sleep like a ‘starfish’. John and Martin were absolutely the best hosts I've ever met. They sent us instructions to get to the villa, however, we did a ticky tour before we arrived in Hua Hin and didn’t arrive until almost 9pm. Martin was happy to meet us on the main road with his motor scooter and guide us to the villa. Without Martin guiding us I don't think we can get to the villa on our own in the dark. John and Martin had already filled up the fridge with drinks, fruits and snacks and some cleaning essential stuff for us to use. They also showed us around the property and provided lots of local information (maps etc). 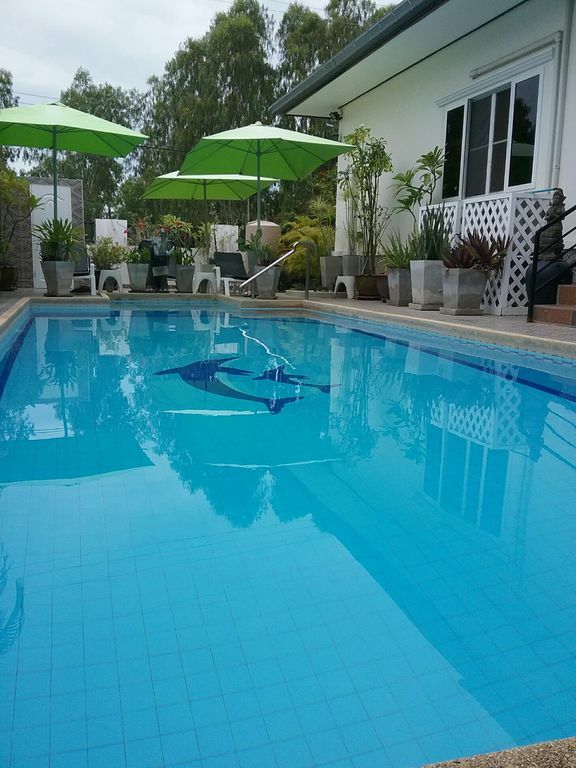 The Villa is not walking distance to the city centre, but if you have your own vehicle It’s a perfect place for your Hua Hin holiday - quiet, peaceful and relaxed. We found the best spot to have shower is outdoors by the poolside because the water pressure is quite low inside and only allows for one shower working at a time. Overall, it is a good experience to live in a house rather than hotel room. A picture paints a thousand words and the pictures for this villa are worthy of those thousand words. I will try not to bore you with irrelevant waffle suffice it to say the villa is a homely well equipped property where anyone should find the type of holiday they are looking for. Whether you want peace and quiet or action the location is good, yes the beach and centre are 15 minutes away (350 baht taxi) but it adds to the experience. The owners Martin and John, down to earth genuine people with a lot of character are just a phone call away if needed. There were a couple of technical/maintenance issues whilst we were in residence but minor and were being rectified. The private pool was excellent (cleaned three times whilst we were there), a great area for children and adults alike and very private. Cooking/kitchen facilities okay but when the nearby local restaurants are so inexpensive and you are on holiday why bother cooking. There was a good choice of films available on the entertainment system but uk dvd's will not de-code on the player, only a problem if you want to waste time in front of a tv screen. The Club House with its large swimming pool, restaurant and gymnasium is well worth visiting and is only a 5 minute stroll through the complex. All in all we had a great time and would highly recommend this villa as a base. I would not hesitate to stay here again. We are situated in the charming village of Bo Fai, approx. 6 km north of Hua Hin centre, and set within a 5* resort. The surrounding area is very picturesque and tranquil, with both mountain and sea views, yet less than 10 min to the nearest beach area and 15 min into town. There are restaurants both on site and within a 10 min stroll, and there are two others within a 5 min drive, all serving excellent food, in lovely settings and at prices to die for. Golf: For golf enthusiasts there are no less than 12 international courses, all within short driving distances, the nearest being Palm Hills, which is a 10 min drive.